terms of replacement labour and shorter service cycle. 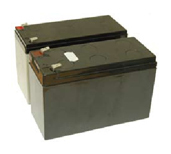 A worn battery entails a risk of unexpected load loss. In normal UPS operation, backup power is needed only occasionally and the battery ‘wearing’ rate depends strongly on how the full charge is being maintained. Excess charging is detrimental under any operating circumstances. of battery life upon detection of a weak battery. It also optimises the recharge time, which is advantageous when there may be consecutive power outages within a short period. ABM has been used for over 15 years in our UPSs ranging from 1 to 160 kVA and User benefits is now applied in UPSs up to 1100 kVA. 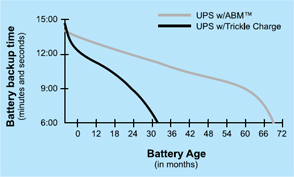 ABM technology significantly increases battery service life.